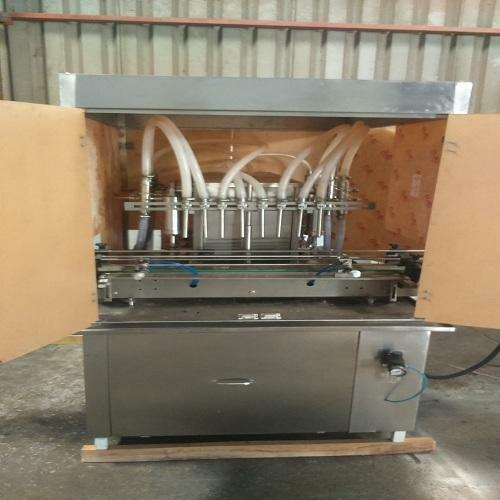 In line with clients' diverse requirements across the country, we are offering Vegetable oil packing machine that work on volumetric principle with diving nozzles. The machine is mechanically operated, which does not require any compressor. Our range is widely used for filling bottles automatically in various industries like chemical, food processing & pharmaceutical. These machines ensure faster and efficient filling of liquids. The main drive of the filling machine and conveyor drive consist of A/C Motor with synchronized variable A/c Frequency drive. Established in the year 2010, in Ahmedabad (Gujarat, India), we “Medi-Pack Process & Technologies”, are the renowned manufacturer, exporter, trader and supplier of supreme quality Bottle Capping Machine, Bottle Filling Machine, Bottle Labeling Machine, Bottle washing machine, Bottle Inspection Machine, Packing Conveyor Belt, Automatic Liquid Filling Line, Turn Table, etc. These machines are ideal for the industrial and non-industrial purpose. With the valuable assistance of skilled team of engineers, we are bale to manufacture these machines in adherence to set industry standards. The machines provided from our end are known for long service life, Smooth workflow, Low maintenance, fewer power consumptions, and durability. Our state-of-the-art infrastructure base unit is the support system of our organization that is equipped with high-tech machines and technologies. Further, this unit is divided into different functional departments such as manufacturing, designing, quality testing, warehousing, packaging, etc. These units are supervised by our talented professionals who are trained in handling installed machines. Our professionals enable us to reach the pinnacle of success through their hard work and practical business experience. Years of intensive research in providing flawless range of machines enable us to position a remarkable name in the market.